ARE YOU THINKING ABOUT A SLATE ROOF? For sheer impressiveness, there are few things that can compete with the beauty and durability of a natural slate roof. The use of slate as a roofing material goes back 700 years or more, and slate has been used on roofs in North America since the early days of colonization. At that time all slate had to be imported from Europe, a practice that continued until the 1840′s, when high quality slate began to be quarried in Vermont. Slate shingles reached the height of their popularity in the United States in the first fifteen years of the twentieth century. At that time there were over 200 slate quarries active in the US. The decline in the application of slate roofs coincided with the rise of asphalt shingles as the roofing material of choice. You can expect a slate roof to last from 60 – 125 years depending on a variety of factors, including the quality of the slate used and the style of the roof being shingled. With proper maintenance and repair they can actually last quite a bit longer than that. There are slate roofs in Europe that are still in good shape after 400 years. In addition to the quality of the slate itself, a critical factor affecting the life expectancy of a slate roof is the quality of the installation. Installing a slate roof properly is a craft that takes years to learn and longer to master. It is very important that the installer be experienced in working with slate. It’s definitely not a task to be left to an amateur. If you are planning on having a slate roof installed there is another factor you will have to keep in mind. It’s obvious once you think about it – if you plan on installing a roofing material that is expected to last for 125 years or more, all the structure supporting it will need to last that long as well. It does no good to have a perfectly good roof on top of a deteriorating structure. That structure will also have to be extremely beefy. 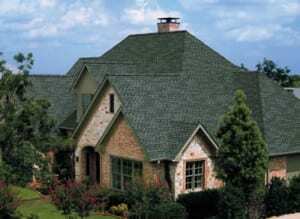 Slate shingles weigh four to six times as much as standard asphalt shingles. You do not decide midstream that slate will be your roofing material of choice. As with so many roofing choices, there are new versions of slate shingles on the market. They combine traditional slate with new high tech roofing materials – cutting the costs associated with traditional slate. The newer examples also cut the weight of a slate roof, which cuts the cost of the heavier framing needed to support old-fashioned slate. Now it’s possible to have a real slate roof at a cost comparable to that of cheap imitations, and have warranty periods unmatched by most other roofing materials. If you are considering using slate to roof your home, it’s hard to see where you can go wrong. A slate roof offers beauty to last a lifetime.